Home > Heavy Duty V Belts > Moulded Notch V-Belts. AX, BX, CX, 3VX and 5VX Sections. > BX Series. 21/32" WIDE COGGED V-BELTS (TRI-POWER/KING COG/PRIME MOVER) > BX 100 Molded Notch V-Belt. (Tri-Power/Bando King Cog) > B100 Classical V-Belt. Bando Power King. 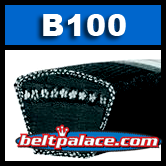 B100 V BELT, 103 inches O.C. B100 Classical V-Belt. Bando Power King. B100 V BELT, Bando Power King. 5/8" x 103" Outside Lenght - Lawn Equipment and industrial V Belt replacement.